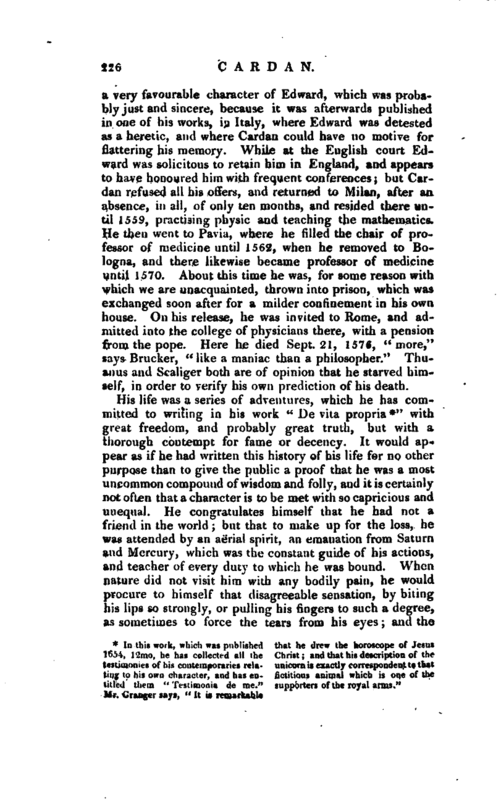 , an Italian physician, mathematician, and philosopher, was born at Pa via, Sept. 24, 1501. It appears that his father and mother were not married, and the latter, a woman of violent passions, endeavoured to destroy him by procuring abortion. 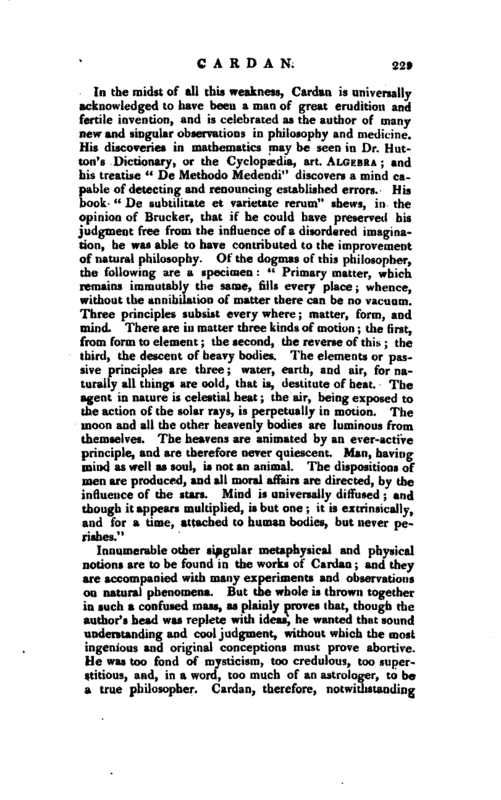 He was, however, safely born, and his father who was a lawyer by profession, at Milan, and a man well skilled in what were then called secret arts, instructed him very early in the mysteries of numbers, and the precepts of astrology, He taught him also the elements of geometry, and was | desirous to have engaged him in the study of jurisprudence. But his own inclination being rather to medicine and mathematics, at the age of twenty he went to the university of Pavia, where, two years after, he explained Euclid. He then went to Padua, and, in 1524, was admitted to the degree of master of arts, and in the following year to that of doctor in medicine. 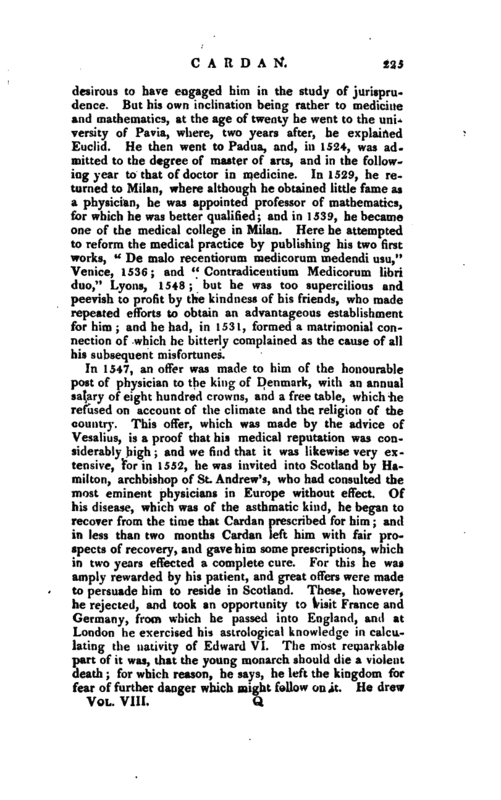 In 1529, he returned to Milan, where although he obtained little fame as a physician, he was appointed professor of mathematics, for which he was better qualified; and in 1539, he became one of the medical college in Milan. Here he attempted to reform the medical practice by publishing his two first works, “De malo recentiorurn medicorum medendi usu,” Venice, 1536; and “Contradicentium Medicorum libri duo,” Lyons, 1548; but he was too supercilious and peevish to profit by the kindness of his friends, who made repeated efforts to obtain an advantageous establishment for him; and he had, in 1531, formed a matrimonial connection of which he bitterly complained as the cause of all his subsequent misfortunes. In 1547, an offer was made to him of the honourable post of physician to the king of Denmark, with an annual salary of eight hundred crowns, and a free table, which he refused on account of the climate and the religion of the country. This offer, which was made by the advice of Vesalius, is a proof that his medical reputation was considerably high; and we find that it was likewise very extensive, for in 1552, he was invited into Scotland by Hamilton, archbishop of St. Andrew’s, who had consulted the most eminent physicians in Europe without effect. Of his disease, which was of the asthmatic kind, he began to recover from the time that Cardan prescribed for him; and in less than two months Cardan left him with fair pro* spects of recovery, and gave him some prescriptions, which in two years effected a complete cure. For this he was amply rewarded by his patient, and great offers were made to persuade him to reside in Scotland. These, however, he rejected, and took an opportunity to visit France and Germany, from which he passed into England, and‘ at London he exercised his astrological knowledge in calculating the nativity of Edward VI. The most remarkable part of it was, that the young monarch should die a violent death; for which reason, he says, he left the kingdom for fear of further danger which might follow on it. He drew | a very favourable character of Edward, which was probably just and sincere, because it was afterwards published in one of his works, in Italy, where Edward was detested as a heretic, and where Cardan could have no motive for flattering his memory. While at the English court Edward was solicitous to retain him in England, and appears to have honoured him with frequent conferences; but Cardan refused sril his offers, and returned to Milan, after an absence, in all, of only ten months, and resided there until 1559, practising physic and teaching the mathematics. He then went to Pavia, where he filled the chair of professor of medicine until 1562, when he removed to Bologna, and there likewise became professor of medicine until 1570. About this time he was, for some reason with which we are unacquainted, thrown into prison, which was exchanged soon after for a milder confinement in his own house. 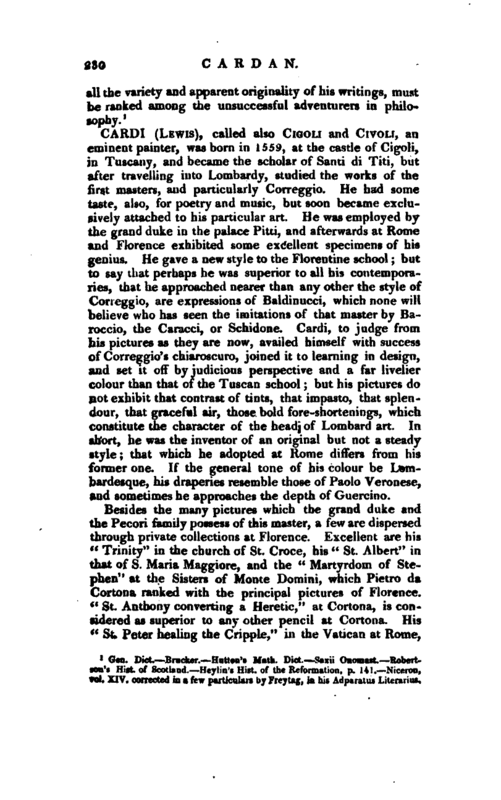 On his release, he was invited to Rome, and admitted into the college of physicians there, with a pension from the pope. Here he died Sept. 21, 1576, “more,” says Brucker, “like a maniac than a philosopher.” Thuanus and Scaliger both are of opinion that he starved himself, in order to verify his own prediction of his death. 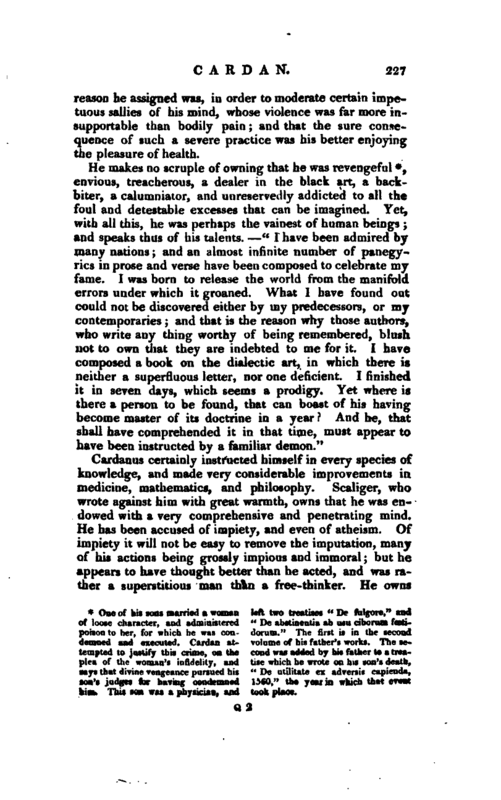 | reason he assigned was, in order to moderate certain impetuous sallies of his mind, whose violence was far more insupportable than bodily pain; and that the sure consequence of such a severe practice was his better enjoying the pleasure of health. One of his sons married a woman of loose character, and administered poison to her, for which he was condeemed and executed. 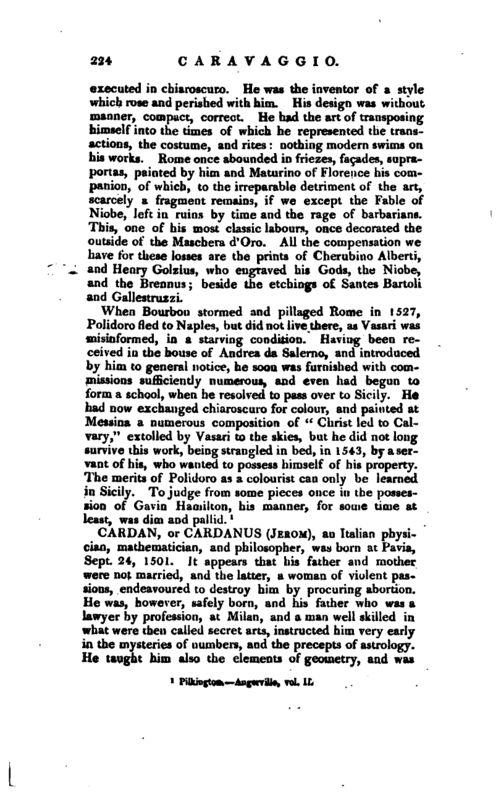 Cardan attempted to justify this crime, on the plea of the woman’s infi.ieUy, and says that divine vengeance pursued his son’s judges for having condemned him, This am was a physician, and left two treatises “De fulgbre,” and “De abstinentia ab usu ciborum- foetidoruvn.” The first is in the second volume of his father’s works. The second was added by his father to a treatise which he wrote on his son’s death, “De utilitate ex adversis capienda, 1560,” the year in which that vttnfc took place. Cardanus certainly instructed himself in every species of knowledge, and made very considerable improvements in medicine, mathematics, and philosophy. Scaliger, who wrote against him with great warmth, owns that he was endowed with a very comprehensive and penetrating mind. He has been accused of impiety, and even of atheism. Of impiety it will not be easy to remove the imputation, many of his actions being grossly impious and immoral; but he appears to have thought better than he acted, and was rather a superstitious man than a free-thinker. He owns | himself that he was not a devotee, parum pius; but at the same time he declares, that though he was naturally very vindictive, he often let slip the occasion of satisfying his resentment, out of veneration for the Deity, Dei ob vcncrat ion em. He says, " There is no form of worship more pleasing to the Deity, than that of obeying the law, notwithstanding the strongest impulses of our nature to trespass against it.’' He says he was sometimes tempted to lay violent hands on himself, which he calls heroic love; and imagined that several other persons have been possessed with it, though they did not own it. 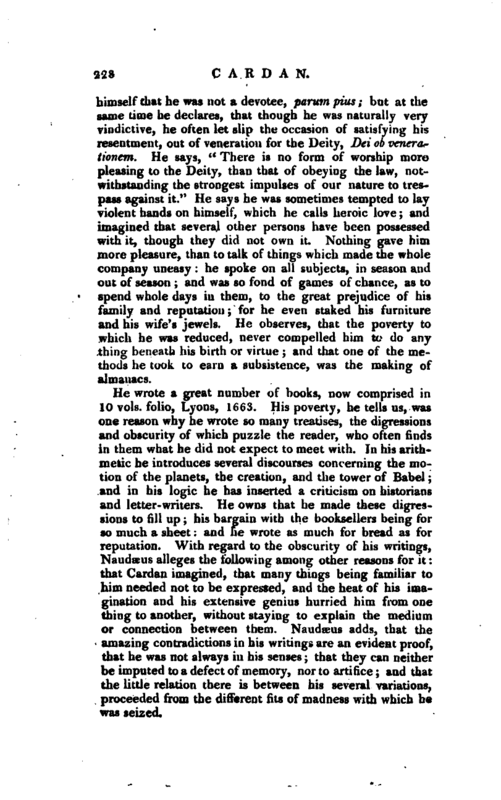 Nothing gave him more pleasure, than to talk of things which made the whole company uneasy: he spoke on all subjects, in season and out of season; and was so fond of games of chance, as to spend whole days in them, to the great prejudice of his family and reputation; for he even staked his furniture and his wife’s jewels. He observes, that the poverty to which he was reduced, never compelled him to do apy thing beneath his birth or virtue; and that one of the methods he took to earn a subsistence, was the making of almanacs. Gen. Dict. Brucker. —Hutton’s Math. Dict. Saxit Onomast. Robertpn’s Hist, of Scotland. Heylin’s Hist, of the Reformation, p. 141. —Niceron, vol. XIV. corrected in a few particulars by Freytag, in li.s Atljmraius Literarius.